Believe it or not: In 1978, nearly forty years ago, you could shop from home, check stock prices, get news, make plane reservations, even send messages to other online users. The only hitch: you had to be in France. The device you see above you is a Minitel, a computer terminal installed in French households throughout the 1970s and 1980s. It was a service of the French Post Office and had a surprising amount of function. It connected via phone line and became one of the most powerful home devices of the time. Today it looks like a relic (personally I don’t know why but the “Espace” key cracks me up” but it was really high tech back then. The service was very primitive by today’s standards, since it had to rely on a 300 baud (.003Mbps) modem that could barely handle text. Still, it was so popular that it continued on well into the modern internet era. The terminals were free to French homes, and it was used for everything from community organizing to full-on political activism, much as Twitter is today. 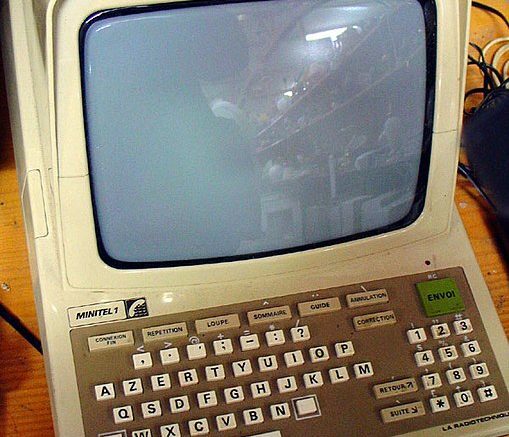 Here’s the most amazing thing about Minitel… despite all the advances in internet technology, the service actually wasn’t retired until the summer of 2012, just five short years ago. That’s quite a testament to its popularity. Now, of course, French citizens rely on their smartphones just like the rest of us, but don’t forget that they had a 20-year head start.